21 specialty drinks, including the world’s first one-touch Americano and Café latte with parallel preparation of coffee and milk. Touchscreen technology and App compatibility for customizing and preparing drinks. Makes up to 5 shots of coffee at once/brews up to 70oz of coffee. 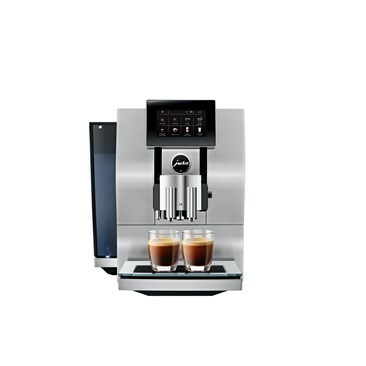 JURA Z8 - 21 specialty drinks, including the world’s first one-touch Americano and Café latte with parallel preparation of coffee and milk. Touchscreen technology and App compatibility for customizing and preparing drinks. Makes up to 5 shots of coffee at once/brews up to 70oz of coffee. JURA X8 - For self-service areas, larges offices and catering. 21 drink specialties. One-button process brews up to 5 single coffees at once, or up to a 40-oz. jug of coffee. Intuitive TFT color display. JURA’s Smart Connect for use with JURA’s new exclusive free app, J.O.E.® (JURA Operating Experience). JURA A1 Piano white - slim-line one-cup machine with advanced features including Pulse Extraction Process (P.E.P. ), which optimizes extraction time for ristretto and espresso. Easy-to-use touch panel with three cup sizes and two aroma levels. CLEARYL Blue water filter and height-adjustable coffee spout. Capresso Infinity Plus Grinder - 25% larger capacity. 11oz see-through bean container. Commercial-grade solid steel conical burrs and high-precision advanced cutting design. 16 fineness settings for any brewing method. Silkscreen design with larger font, red indicators for clear viewing and curved selector knob. Capresso froth Select - Prepares café quality milk for cappuccinos, lattes, flat whites and more. Frothy hot chocolate using chips, chunks, syrup or powder. One-button operation. 4 settings: cold froth, hot froth, hot milk or hot chocolate. Premium stainless steel pitcher holds up to 20oz heating/16oz frothing. Capresso H2O Select - 11 temperature settings from 110°F to 212°F. Programmable keep warm and boiling duration. Removable micro filter traps particles. Concealed low-noise heating element. Kettle lifts easily off detachable base for pouring/serving. Safety auto shut-off. Dry boil protection. JURA S8 Chrome or Moonlight Silver - JURA’s largest color display features a 4.3” high-resolution touchscreen. 15 drink specialties from Caffè latte to hot water for green tea. Pulse Extraction Process for a professional quality brew. Newly designed professional fine foam frother. Easy press & hold programming. Capresso EC300 - High-pressure brewing and frothing with advanced features, attention to detail, and value. Illuminated control knob – for brewing, frothing or steaming – makes for simple operation. Dual frother wand, stainless-steel lined ThermoBlock heating system and a heavy-duty portafilter. Capresso H2O Glass Rapid-Boil - Faster, safer and more efficient than any stovetop kettle. Offers durable heat-resistant German SCHOTT glass and a patented stainless steel heating dome. Capresso is the only brand with this technology. New lid, handle and power base for more functionality and visual appeal. JURA E6 - Delivers ultimate coffee quality, thanks to Jura’s Pulse Extraction Process, Aroma G3 grinder and more. 8 intensity levels for a customized brew. Self-explanatory TFT color display. Front-filling water tank, with Intelligent Water System and CLEARYL Smart filter to ensure pure, fresh taste. JURA E8 Chrome or Black - Jura’s exclusive Pulse Extraction Process brews the most flavorful espresso every time. One-Touch Cappuccino function for cappuccinos, latte macchiatos, flat whites and more. A true bean-to-cup experience that’s freshly ground, not capsuled. Large color display to personalize your brew. JURA Z6 (Aluminum & Aluminum Black) - A world first, Pulse Extraction Process optimizes extraction time for barista-style coffee at 10 different intensity levels. 10 different milk temperatures, a new Aroma G3 Grinder, automatic filter detection and milk cleaning system. For coffee that’s freshly ground, never capsuled. Capresso SG220 - A sleek and stylish coffee maker with stainless steel accents, designed for maximum flavor. A full 12-cup capacity in a compact design with small footprint. 24-hour programmable clock/timer with backlit LCD display. Glass carafe with brew-through lid, ergonomic handle and drip stop. JURA WE8 - Designed for the workplace, with innovative technologies including Pulse Extraction Process for a barista-style brew from freshly ground beans. 12 specialties at the touch of a button. TFT display, 6-level Aroma G3 grinder, Intelligent Water System and multiple programming options. Capresso froth Control - The first countertop frother that can accommodate chocolate chips and chunks for delicious frothy hot chocolate. Simple 1-button operation with illuminated controls, for cold froth, hot froth, hot milk or hot chocolate. For trendy flat whites, cappuccinos, lattes, hot cocoa and more. Capresso ST300 & SG300 - Updated design with advanced features. GoldTone filter, charcoal water filtration, programmable 24-hour clock/timer, and more. With 10-cup stainless steel thermal carafe or 12-cup glass carafe, both with ergonomic handle, brew-through lid and drip-free pouring spout. Capresso Perk (8 & 12 Cup) - The 8-Cup Perk brews 4 to 8 cups of coffee – or 4 to 12 cups for the 12-Cup Perk – in less than a minute per cup. Durable stainless steel construction with view-through glass lid. Automatic keep-warm function. Illuminated light when coffee is ready. Heat-resistant base. Capresso Mini Kettle - Compact and portable, it features a micro filter that traps any particles before they reach the cup. Ideal for boiling water for tea, pour-over coffee, cocoa mixes, hot soups, and more. Dry boil protection and automatic shut-off. Heat resistant base. Capresso froth MAX - Perfect frothing action thanks to a unique patented technology that quickly whips air into milk while heating it to your choice of cold, warm or hot temperature settings. Special heating disk for warm or hot milk without froth. Can froth milk or non-dairy products. Capresso Café PRO - Professional-style espresso and cappuccino machine with heavy-duty stainless steel construction. Stands out for its advanced pump boiler heating system, commercial-style power frother, and multiple espresso filter choices for choosing your favorite brewing style. Cup warming compartment. Capresso Ultima PRO - 15-bar pump for optimal pressure for rich crema. Self-tamping portafilter for automatic and hassle-free tamping. High pressure frothing for milk foam for thick, rich cappuccinos. Stainless steel cup warming platform. Programmable illuminated icons. 34-oz. removable water tank. Capresso M900 Series - Programmable coffee maker with beautiful stainless steel housing for superior strength. MG900 (glass carafe) and MT900 (thermal carafe) can rapid brew up to 10 cups of coffee in less than 7 minutes, for maximum flavor and aroma. 50-oz removable water tank. Capresso CoffeeTEAM PRO Plus - Bean-to-carafe coffeemaker. Enhanced bean container and grinder assembly help oily beans flow freely into chamber. Bean container, upper burr and water container removable for easy cleaning. Automatic 2-step grind and clean chamber. 10-cup thermal carafe or 12-cup glass carafe. Capresso Cleaning Solution - Helps maintain the quality of Capresso espresso machines, coffeemakers and electric water kettles to ensure the full flavor and freshness of coffee and tea time and again. Makes scheduled descaling maintenance easy and convenient. Comes with three cleaning solution packets per box. Capresso EC PRO - The commercial-grade EC PRO Professional Espresso & Cappuccino Machine features two filter choices: a heavy-duty double spout espresso filter, for convenience and ease, and a bottomless espresso filter, for brewing like a barista. JURA A1 - A slim-line one-cup machine with advanced features including Pulse Extraction Process (P.E.P. ), which optimizes extraction time for ristretto and espresso. Easy-to-use touch panel with three cup sizes and two aroma levels. CLEARYL Blue water filter and height-adjustable coffee spout. Capresso Cool Grind PRO - The Cool Grind PRO is a premium blade grinder engineered for low heat build-up to preserve more flavor and aroma. Designed for use with coffee beans or spices, such as rosemary, cardamom, fennel seeds and more. Available in stainless steel housing. Capresso Mini Drip 5-Cup - This compact programmable coffee maker quickly brews 25 ounces into a glass carafe with an ergonomic handle, brew-through lid and drip-free pouring spout. It features digital controls with an easy-to-read LCD display and 24-hour clock/timer, for programming brewing at your desired time. Capresso Iced Tea Maker - Featuring a glossy white exterior and stainless steel accents, the Capresso Iced Tea Maker brews tea over ice into a beautiful 80-ounce glass pitcher, with lid. Brew from loose tea or tea bags, and adjust to taste using the brew strength slide lever. Capresso On-the-Go - Capresso On-the-Go Personal Coffee Maker features a 16-ounce stainless steel insulated thermal travel mug and an advanced compact brewer with full stainless steel housing. Brews from ground coffee or soft pre-packaged coffee pods in under 4 minutes. Capresso Steam PRO - Compact and user-friendly, the Capresso Steam PRO Espresso & Cappuccino Machine features a sophisticated silhouette and classic color scheme: black and stainless steel. For everyday use, it can brew 2 to 4 cappuccinos or lattes in under 5 minutes.